As we transitioned from “cruising curious” to “let’s make a 5-year plan” to “let’s leave on Wednesday”, we read a ton. Naturally, we wanted to know what it would be like to live on a sailboat and travel full-time. So we read cruising blogs, magazine articles, and books (lots of books) with everything from hilarious mishaps at sea to practical advice. Of everything we read, we learned the most from books by Lin and Larry Pardey. The Pardeys started cruising in the late 1960s, and together they spent four decades sailing around the world twice, arriving in ports in every ocean on two different boats, both under 30 feet. Oh, and they built both boats themselves! Lin and Larry started writing soon after they left California, as a way to fund their cruising plans. Ever since, they have inspired couples to “Go simple, go small, and go now.” We are so grateful to have the stories from their voyages and their wisdom on staying safe, living comfortably afloat, and most importantly, enjoying the adventure. The Pardeys have written a dozen books, but The Care and Feeding of Sailing Crew is my favorite. (John has a tough time choosing his favorite from a series of four different books covering Lin and Larry’s early voyages on their first boat, 24-foot Seraffyn.) Of course, the primary topic is sailing, but the themes of teamwork, romance, exploration, and simplicity are what makes their writing so special. Lin wrote the first edition of Care and Feeding during the Pardeys’ 4,500-mile, 49-day passage from Yokohama, Japan to Victoria, British Columbia in 1978. Each chapter begins with Lin’s menu for the day, then she dives into a relevant subject—like provisioning in foreign countries, handling sea sickness, organizing stores, etc—to demystify what’s it’s really like for the person in charge of crew comfort. Here on Pineapple, John is the skipper and I’m in charge of keeping us fed and happy living aboard. I read Care and Feeding just as we were leaving San Francisco, during my transition from business suits and Powerpoints to more “domestic” responsibilities. Lin helped me understand how important and challenging this role is, and I think that’s a big reason why I love this book so much. Lin writes: “It is a different world out there. Not only are you far from easy shopping facilities, but you are in ever-changing climates, limited space, and limited facilities. The constant demands of keeping a boat moving and secure only add to the pressure on the person in charge of crew care. It is a challenge I relish.” Pretty darn motivating, amiright? Now, we are not about to leave for any 49-day passages. But in between stops in well-resourced areas, we routinely need to be self-sufficient for days at a time. As an example: We just covered 365 miles in six days, with only one stop, and I knew we’d be on our own for food. 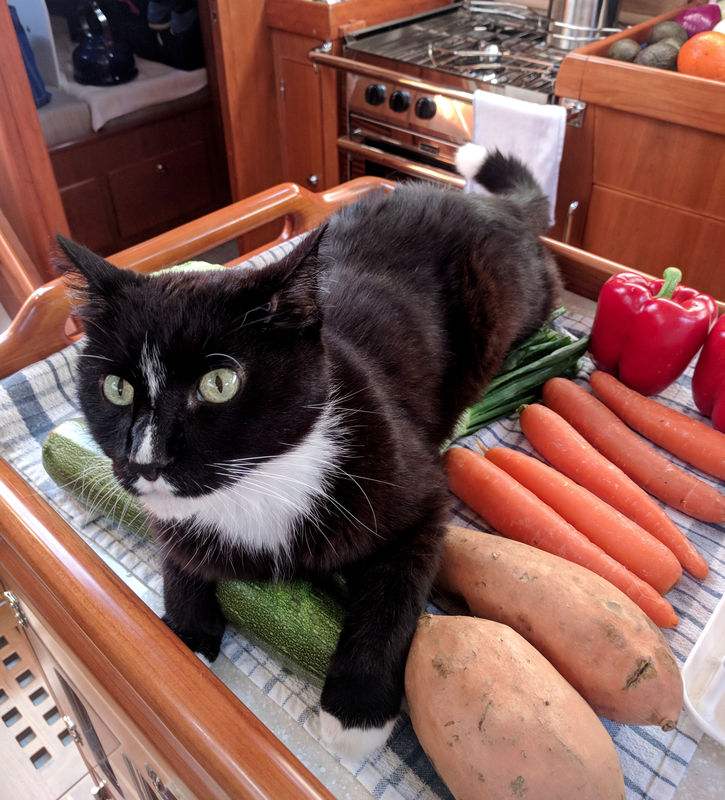 So, I thought it might be interesting to take you behind the scenes and into the galley, as we prepared and spent most of the week traveling along the coast. Here’s what we ate, and a few highlights along the way, during our recent trip from Zihuatanejo to Huatulco. Zihua has lots of good options for shopping, but we were anchored there and did not have the convenience of a taxi dropping us off a few feet from the boat, as we would at a marina. All provisions needed to be transported in our dinghy, which is quite small, so we needed to be conscious of how much we bought. We decided to provision over two days. The first day, we walked to the supermarket for non-perishables, meat, and cheese. On the second day, we walked to the municipal market, where we bought two dozen eggs and a bunch of fresh produce. And if you think Chase could stay out of the action, even as we’re preparing to cast off, well, think again! “Paleo muffins”. My favorite for quick breakfast when we are on passage. They’re quite healthy and filling, but still sweet enough to satisfy our craving for morning pastries. 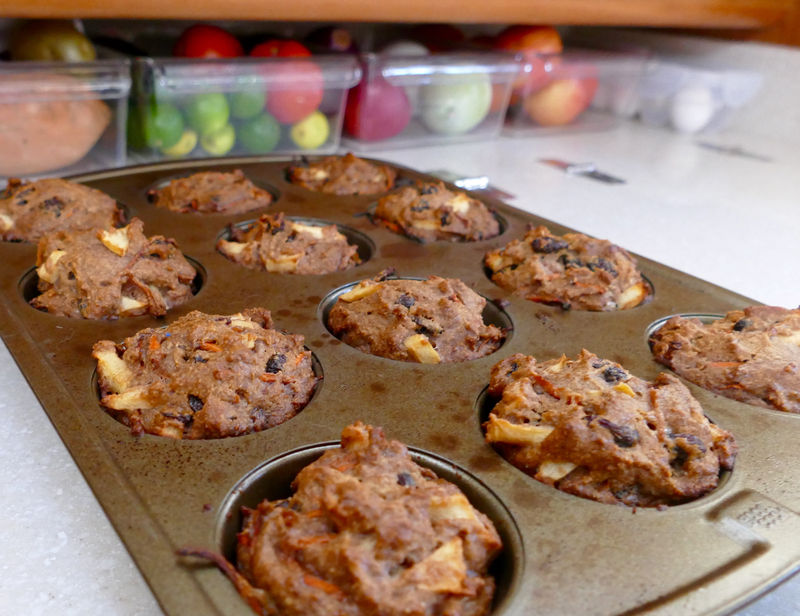 Main ingredients are almond flour, carrots, apple, raisins, eggs, honey, and coconut oil. 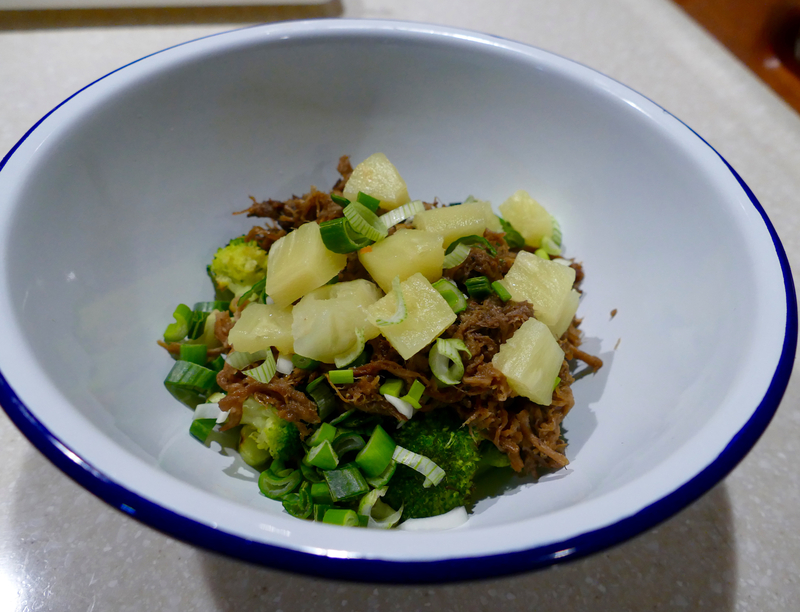 Recipe from my former-co-worker-turned-dietician Laura. 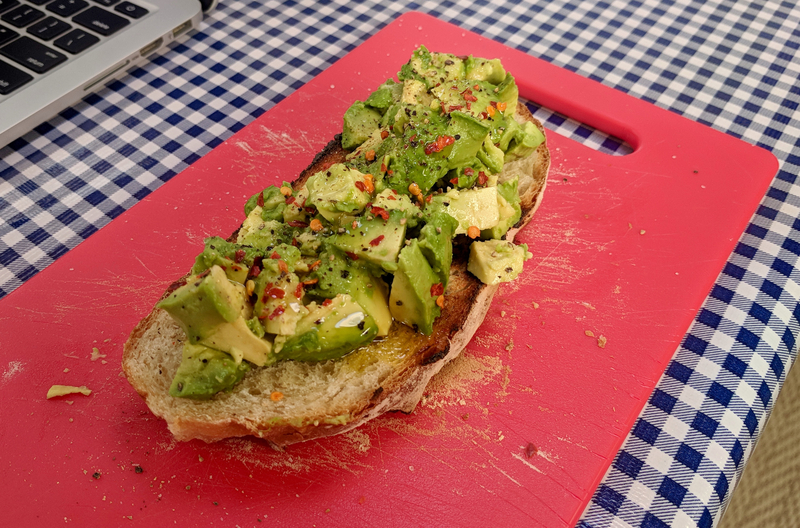 Avocado toast doesn’t have to stop when you leave San Francisco! John prefers his topped with salt, pepper, chili flakes, and olive oil. He just learned that you can refrigerate ripe avocados, which was a total game-changer. Tomato pudding. A recipe straight from Care and Feeding! Sauté tomatoes with garlic, butter, onion, oregano. Then cover with breadcrumbs, salt, and grated parmesan, and bake 20 minutes. Rice salad. Another hit from Care and Feeding, and my favorite way to use leftover rice. Just add cucumber, onion, dill, garlic, a pinch of sugar, some mayo, and let sit for at least an hour. Kale, lentil, and sausage stew. My friend Laura also came up with this flavorful and healthy dinner that we had on heavy weeknight rotation back in San Francisco. We left Zihua with enough wind to sail for the first few hours, a big treat after all the motoring we’ve done lately. And if that wasn’t enough, we were joined by dolphins! It was my first time seeing a pod of dolphins (way too many to count) make a beeline for our boat and then spend 30 minutes swimming with us. They were zig-zag-ing ahead of the bow, swimming alongside the boat, circling back for another round, squealing “hello” as they returned. It was absolutely one of my highlights from years of sailing. A second pod showed up a bit later and the fun started all over again, and it totally rocked. Salami and tomato sandwiches, potato chips, oranges. No matter how hard we try, we are still “sandwich people” through and through. Must be our Midwestern roots. Impromptu happy hour with our buddy boats! Veggies and dip. With a garlic spice blend we found in San Jose del Cabo, we just add plain yogurt, mayo, and cider vinegar. Instant dip! Despite warnings from the U.S. State Department, we spent a few days in Acapulco and totally loved it. As we entered the bay, we were surprised by the clean water, and the city built into the surrounding hills made a beautiful backdrop. We picked up a mooring ball around 10:30am and spent the rest of the day on boat projects. We joined our buddy boats for “sundowners” (that’s cruising lingo for “happy hour cocktails”) to plan the next day as tourists. Pot sticker stir fry. I made this recipe for the first time and it was seriously life changing! Loved every bite. I used half ground pork and half shrimp. 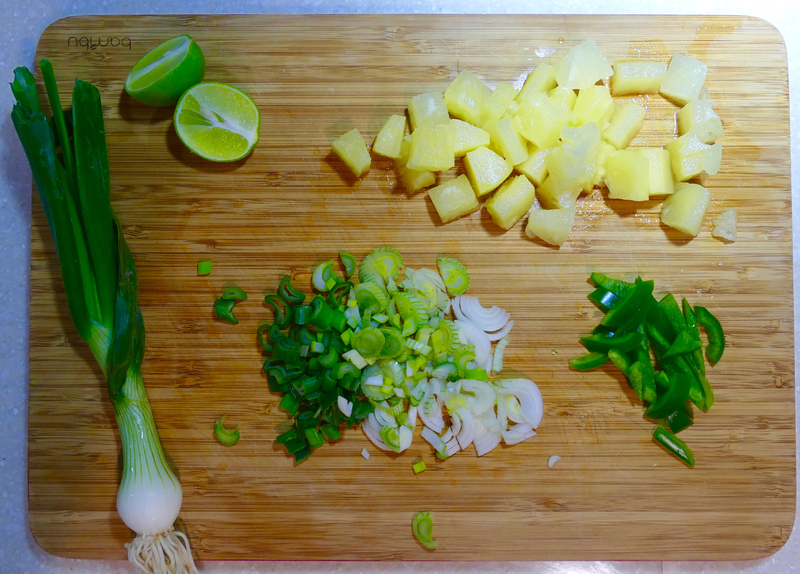 This is a perfect way to get our Asian-food fix on the boat—the ingredients were easy to find and the recipe was simple. Even better, there were leftovers! 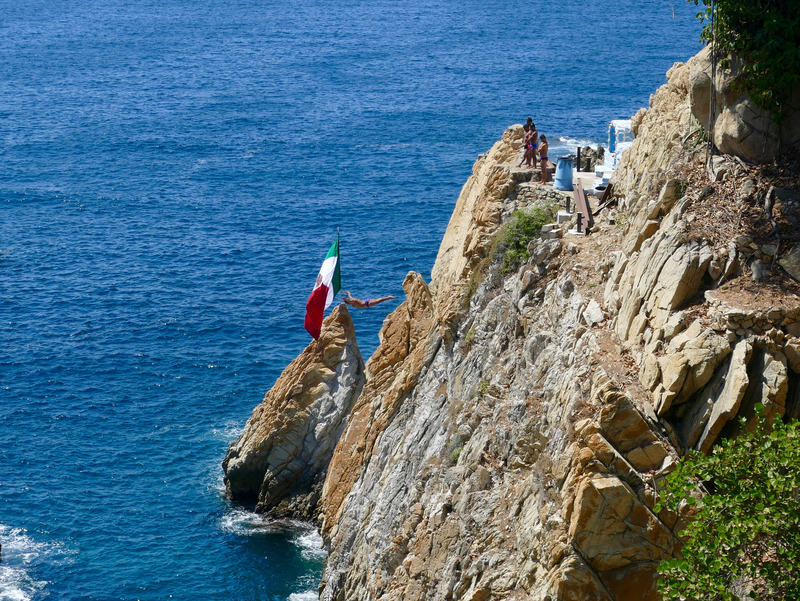 We started the day watching Acapulco’s famous cliff divers. Hotel Miramar has the best views (with decent lunch) and they’re still touting Acapulco’s heyday when celebrities came to vacation. 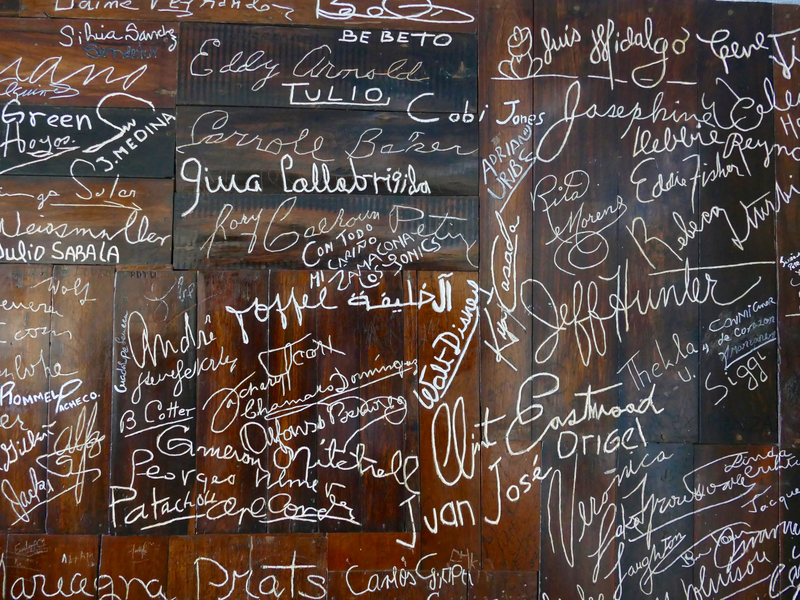 I’m sure you can recognize some of the names on their “Wall of Fame”. 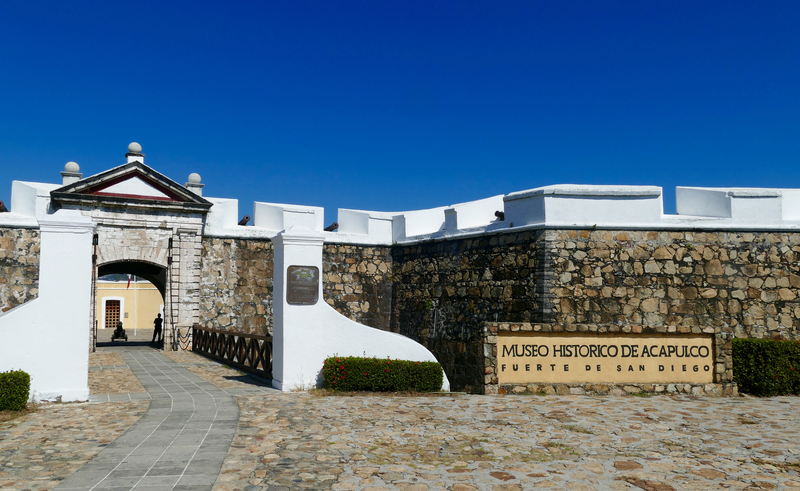 We walked through downtown to the Fort of San Diego and visited the Acapulco Historical Museum. It was perfect for sailors, actually, focusing on the early voyages that established trade routes between Spain, Mexico, and the Philippines. Plus the fort had an amazing 360-degree view of the city. Galley fail! Finicky refrigeration is a common quirk on many sailboats. And on Pineapple, our fridge has certain spots where the food actually stays too cold. (I’m sorry if you are reading this blog and your boat fridge isn’t cold enough.) As a result, the ground beef I took out a day earlier was still frozen. Luckily we had leftovers of the life-changing stir fry, so I threw some eggs on top and made a Greek salad as a side. No problemo. Sailing into Acapulco Bay two days earlier, we were struck by the number of abandoned buildings (some of which had been taken over by squatters). It was clear that Acapulco has fallen on hard times. Considering how much we were enjoying our stay—the people just as nice as everywhere else in Mexico, the geography of the city so unique, and enough activities to fill a much longer stay—it was a little depressing to see the state of city. A lot of money has been invested to “rescue” Acapulco in recent years. We’re rooting for the city to make a comeback. With light winds in the forecast (again), we decided to stay an extra day. We were moored just 100 yards from the Acapulco Yacht Club, and it called our name. As members of the St Francis Yacht Club, we had “reciprocal privileges” with the Club de Yates, and we decided to take advantage! What we discovered was the nicest yacht club we’ve ever visited. After walking the pristine grounds on a guided tour from a club manager, past the private beach and gym and spa, we settled in at the pool. It was tough to get back in the dinghy at 5pm and return to the boat, but we managed. Salami and tomato sandwiches, chips, oranges. Oh, we’re also “potato chip” people. In Mexico we stumbled upon the terrible and amazing “Queso Ruffles” and have eaten more bags than I’m willing to admit. Luckily our Spanish is still not good enough to comprehend the nutritional facts on the package. Yolo? 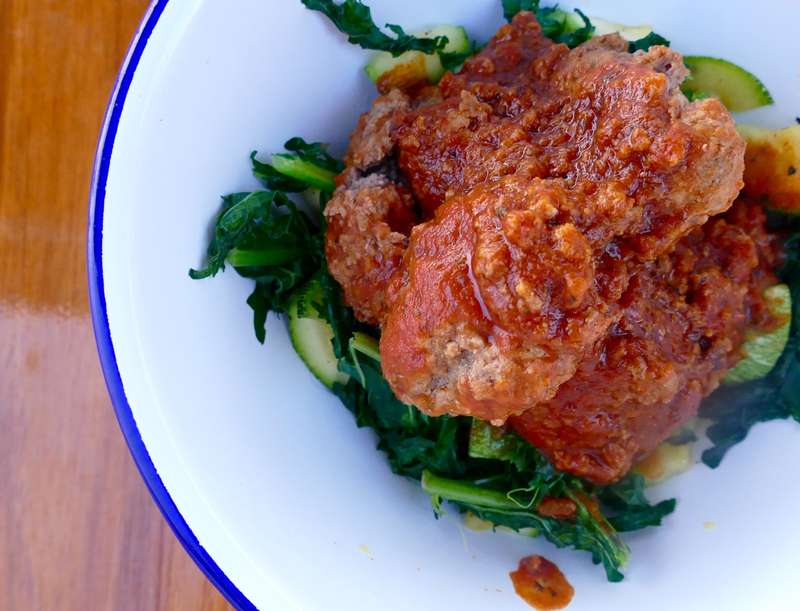 Meatballs with tomato sauce over sautéed kale and zucchini. The meatball recipe is from The Art of Simple Food by Alice Waters, a go-to cookbook for us on land and now aboard Pineapple. 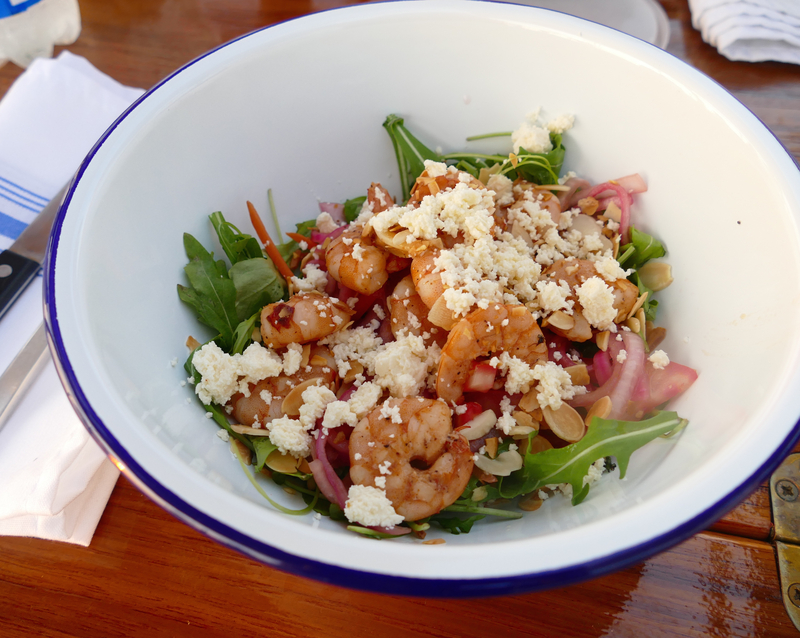 Arugula salad with sautéed shrimp, pickled red onions, carrots, tomatoes, and toasted almonds. I marinated the shrimp in chipotles, chili powder, garlic, and lime juice. Recipe from the America’s Test Kitchen Mexican cookbook (how’s that for cultural cross-pollination?). More dreamy dolphins, lots of sea turtles, calm seas, and little wind. High: Seeing the southern cross (🎶 for the first time…). Low: Snagging a “long line” (mile-long offshore fishing lines suspended along the surface with hard-to-see floats, usually plastic bottles). It slipped below the keel, missed the prop, and got caught on the rudder. Luckily, the pangueros were nearby. They zipped over, cut the line, and re-tied it. After fighting a strong current for the final 18 hours, we made it to Huatulco in the early afternoon. The marina is rustic—we don’t have power or water at our dock, and the showers are outdoors, with cold water—but we are having grand time exploring the area. We’re a little sad to be leaving so soon, but Central America is waiting. Anyway, that’s how we eat when we’re (mostly) on our own! Although this six-day stretch isn’t quite representative. We were blessed with calm seas that made cooking (and everything else) easy. It’s not always that way. For example, when we crossed the Sea of Cortez to Mazatlan, I was seasick for 40 hours and could barely look at a cracker. But the rough passages make the smooth ones sweeter. And being able to enjoy the pleasures of cooking and eating underway is a rare treat that makes these experiences all the more memorable. I love the Dolphin videos. Absolutely amazing!!! Thanks! It was so awesome! Yes! If Lin feels exhausted and sick on day 3, I can too! But I don’t think she would approve of the Queso Ruffles. I love that Sir Chase is so helpful and on top of things! Dolphin video is awesome! That cat, he is a funny fellow for sure!